EVERETT, Wash. - The guided-missile destroyer USS Sampson (DDG 102) is returned home to Naval Station Everett May 9, completing a seven-month deployment. 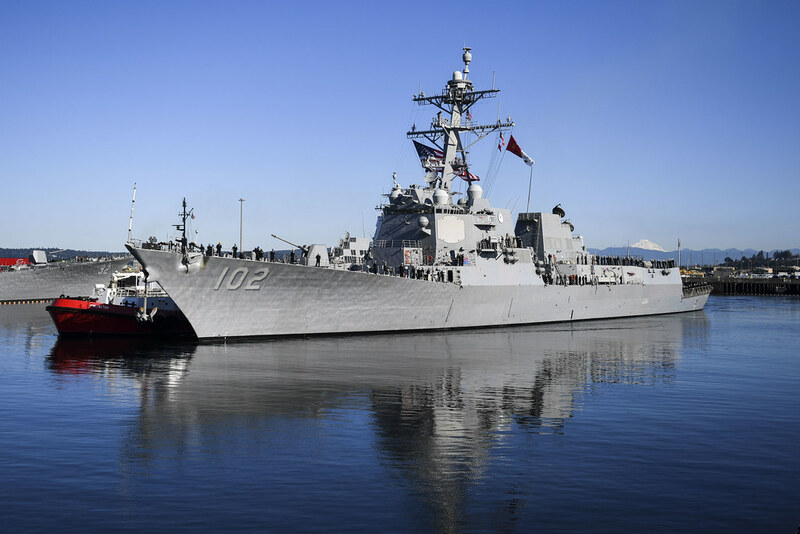 EVERETT, Wash. - The guided-missile destroyer USS Sampson (DDG 102) departed its homeport of Naval Station Everett for a scheduled deployment, Oct. 3. PACIFIC OCEAN (NNS) -- Thirteen Canadian and American midshipmen are spending their month-long summer training aboard the guided-missile destroyer USS Sampson (DDG 102) while the ship is underway. The San Diego Fire Department provided two fire trucks, a Chief, and defensive firefighting positions to assist in establishing and maintaining fire boundaries. The goal of the drill – to identify and overcome communication and operational challenges so that all parties are better prepared in case of a real fire. SAN DIEGO - Cmdr. 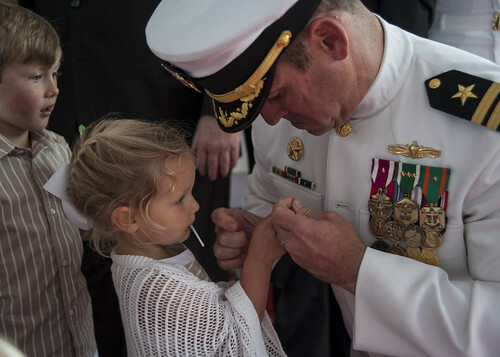 Patrick H. O'Mahoney receives his command pin from his children after relieving Cmdr. Steven M. Foley as commanding officer of the guided missile destroyer USS Sampson (DDG 102). SAN DIEGO - The guided-missile destroyer USS Sampson (DDG 102) returns to its homeport of San Diego after a 212-day independent deployment to the Western Pacific. 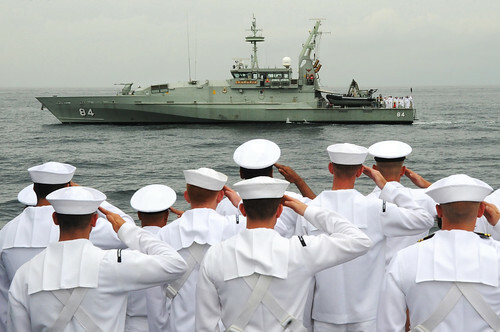 SUNDA STRAIT - Sailors aboard the guided-missile destroyer USS Sampson (DDG 102) salute as the Australian Armidale-class patrol boat HMAS Larrakia (ACPB 84), top, prepares to lay a wreath during a ceremony commemorating the 73rd anniversary of the Battle of Sunda Strait. 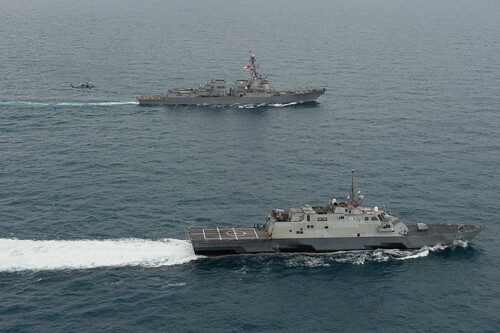 USS Fort Worth (LCS 3), USS Sampson (DDG 102), and an MH-60R Seahawk from Helicopter Maritime Strike Squadron (HSM) 35 operate together in the Java Sea, while supporting the Indonesian-led search effort for AirAsia flight QZ8501. 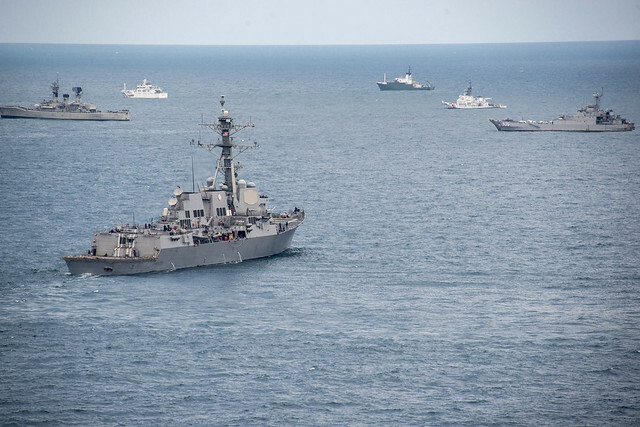 Java Sea - Guided missile destroyer USS Sampson (DDG 102), front, operates with multinational ships near where the AirAsia Flight QZ8501 black box was recovered. 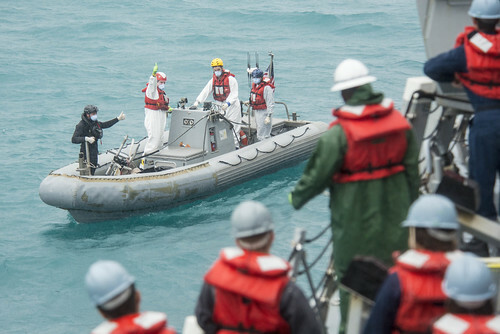 Java Sea - The recovery team from the Arleigh Burke-class destroyer USS Sampson (DDG 102) signals the boat deck crew while conducting search and recovery operations in support of the Indonesian-led Air Asia flight QZ8501 search efforts. 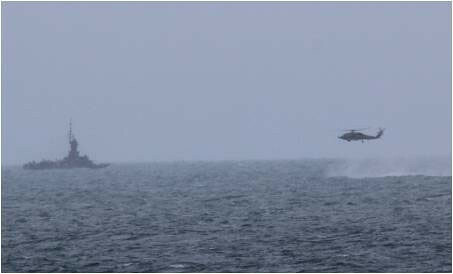 JAVA SEA - An MH-60R Sea Hawk helicopter attached to the guided-missile destroyer USS Sampson (DDG 102) approaches an Indonesian navy patrol vessel while searching for debris during the Indonesian-led search and recovery operations for AirAsia flight QZ8501. From aboard USS Sampson (DDG 102) in the Java Sea, Cmdr. Steven Foley, the ship's commanding officer, talks about Sampson's role supporting Indonesian-led search operations for the downed AirAsia flight QZ8501. YOKOSUKA, Japan (NNS) -- At the request of the Government of Indonesia and as directed by U.S. Pacific Command, U.S. Pacific Fleet has authorized U.S. 7th Fleet to position USS Sampson (DDG 102) in the general search area for missing Air Asia Flight QZ8501 to support search operations. 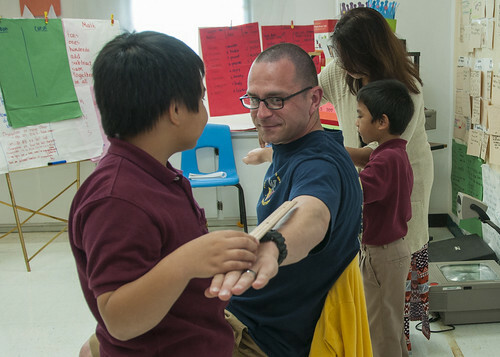 TAMUNING, Guam (NNS) -- Sailors from USS Sampson (DDG 102) spent time with young students during a community relations event at Tamuning Elementary School and Lyndon B. Johnson (LBJ) Elementary School in Tamuning, Guam. PEARL HARBOR The San Diego-based guided-missile destroyer USS Sampson (DDG 102) arrives at Joint Base Pearl Harbor-Hickam for a scheduled port visit. PACIFIC OCEAN – Crew members from the guided missile destroyer USS Sampson (DDG 102) gathered on the ship’s messdecks to observe the ship’s seventh birthday since commissioning. SAN DIEGO - The guided missile destroyer USS Sampson (DDG 102) is scheduled to depart on an independent deployment to the Western Pacific Ocean. 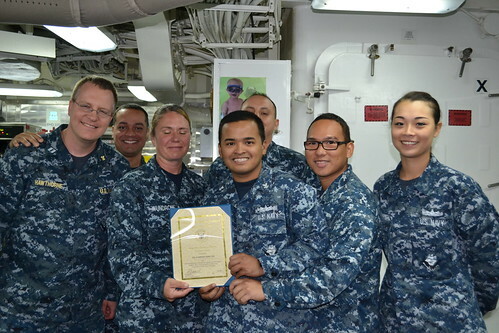 SAN DIEGO – The S-3 division aboard the guided missile destroyer USS Sampson (DDG 102) has been awarded the Navy Exchange Service Command (NEXCOM) Ship’s Store Retail and Service Excellence Award. The crew of the guided missile destroyer USS Sampson (DDG 102) raised a total of $7,371 in donations for the Navy and Marine Corps Relief Society (NMCRS), smashing prior year's contributions by double in just two weeks. 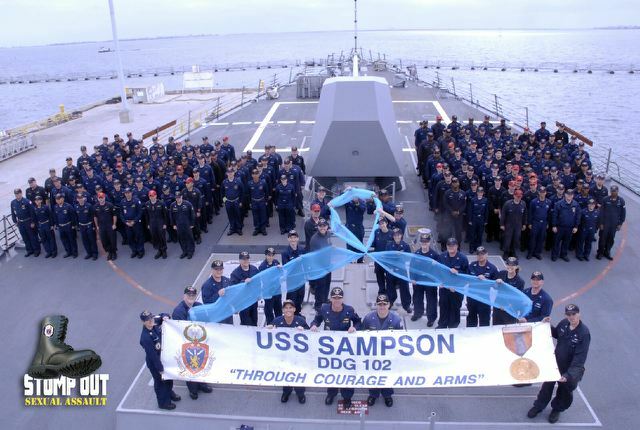 Sailors aboard USS Sampson (DDG 102) support Sexual Assault Awareness Month by displaying the blue ribbon that brings attention to the subject of sexual assault and encourages bystander intervention. 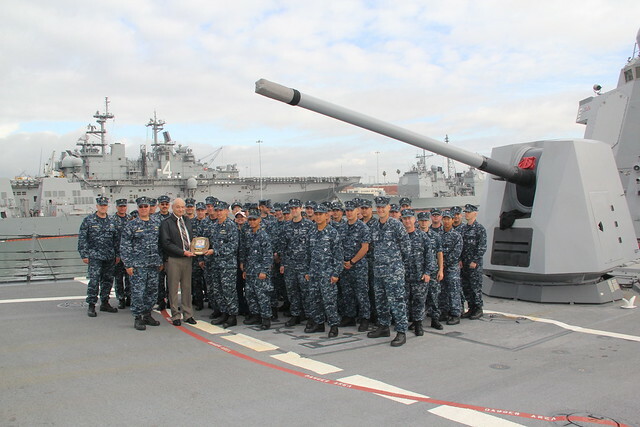 SAN DIEGO – The San Diego-based guided missile destroyer USS Sampson (DDG 102) was named a recipient of the U.S. Navy Pacific Fleet FY-13 Retention Excellence Award. SAN DIEGO – The guided missile destroyer USS Sampson (DDG 102) conducted a change of command ceremony while in homeport at Naval Base San Diego. San Diego, CA - USS Sampson has had a very busy year. 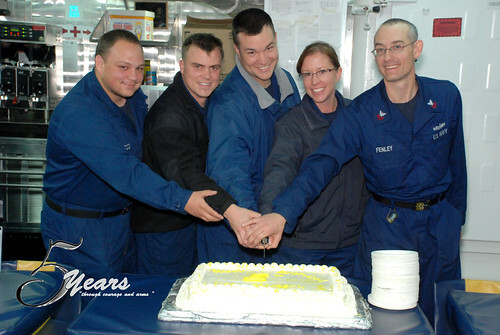 After a six month deployment from February 2012 to August 2012, a brief Post Operational Movement period in September 2012, and Joint Task Force Exercises and Composite Training Exercises in November 2012, Sampson Sailors prepared for the biggest material inspection in the ship’s history, INSURV. 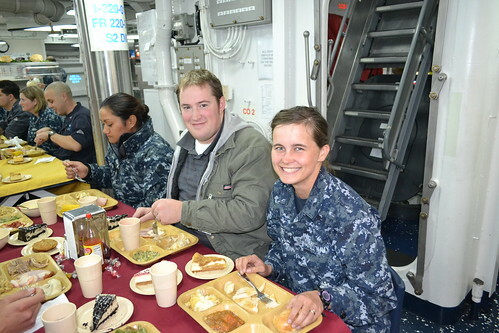 On board, USS Sampson - Newlywed BMSN Emily Coler and her husband, Derek, celebrate their first Thanksgiving together aboard the Sampson. 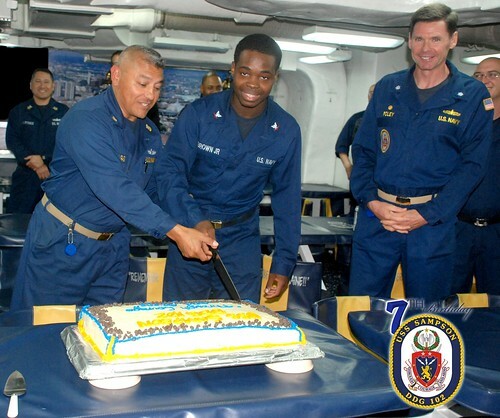 At sea- Sailors aboard guided missile destroyer USS Sampson (DDG 102) celebrated the fifth anniversary of the ship's commissioning. SAMPSON accepts the plaque which commemorates her recognition as the 2011 Spokane Trophy recipient. NAVAL WEAPONS STATION SEAL BEACH, CA – USS Sampson (DDG 102) opened her brow for public tours while in port at Seal Beach, Calif. 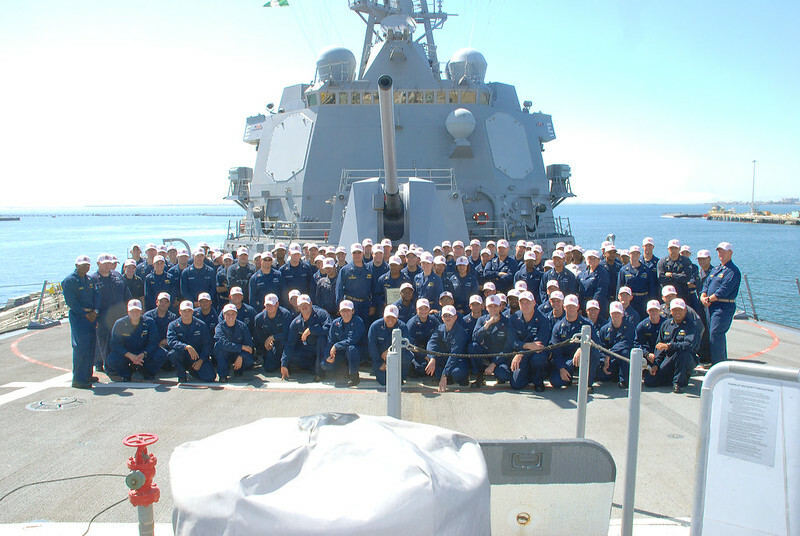 The Crew aboard the USS Sampson has incorporated the color pink into the Uniform of the Day for the month of October. SAN DIEGO - The guided-missile destroyer USS Sampson (DDG 102) is scheduled to return to San Diego after a six-month independent deployment to the Western Pacific and U.S. Central Command areas of responsibility (AOR). 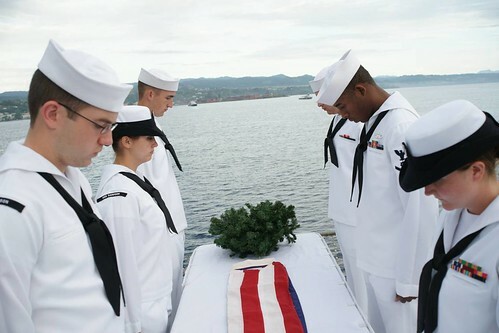 At Sea - USS Sampson Sailors bow their heads during the burial at sea ceremony performed onboard Sampson while anchored in Honiara, Guadalcanal. 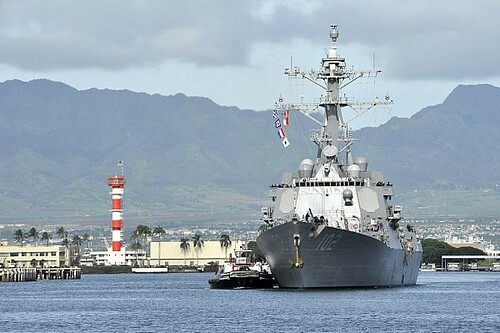 HONIARA, Solomon Islands - Guided-missile destroyer USS Sampson (DDG 102) arrived in Guadalcanal Aug. 6, to take part in the island's commemoration of the 70th anniversary of the World War II Battle of Guadalcanal. Honiara, Guadalcanal - QM1(SW/AW) Charles Thompson poses with Michael Bratten and his father, former Storekeeper Second Class Walter Bratten. KUALA LUMPUR, Malaysia - Sailors onboard Guided Missile Destroyer USS SAMPSON (DDG 102) took part in a Community Relations (COMREL) project at the Agathians Shelter Children’s Home. GULF OF ADEN – Guided-missile destroyer USS Sampson (DDG 102) conducted a change of command, while operating in the U.S. 5th Fleet area of responsibility (AOR), May 9. 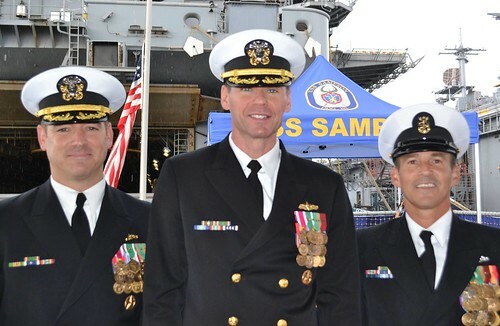 USS SAMPSON welcomed aboard Helicopter Anti-Submarine Squadron Light 37 "Easy Riders" Air Detachment Two (Air Department), home-ported in Pearl Harbor, Hawaii. 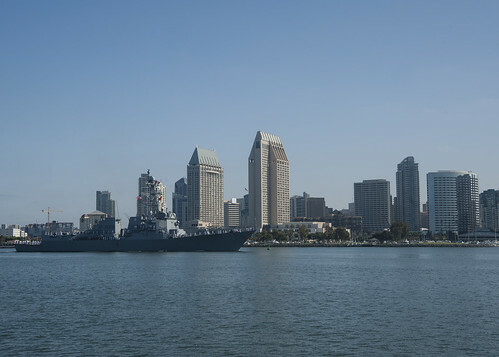 SAN DIEGO – The guided-missile destroyer, USS Sampson (DDG 102), is scheduled to depart for a scheduled six-month, independent deployment to the Western Pacific and U.S. Central Command areas of responsibility, Feb. 24. 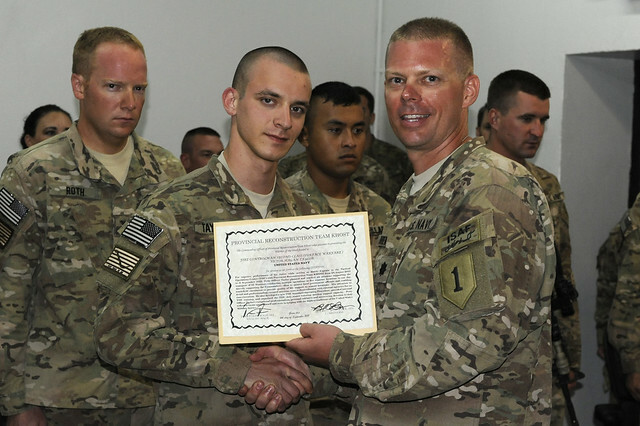 Deployed USS Sampson FC2 earns award in Afghanistan. Crew members from USS Sampson (DDG 102) recovered approximately 60 bales of assorted drugs from the waters of Southern California. 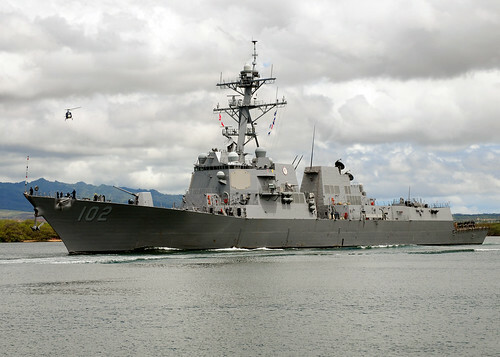 USS Sampson (DDG 102) participates in the Parade of Ships during the 62nd annual Seattle Seafair Fleet Week. 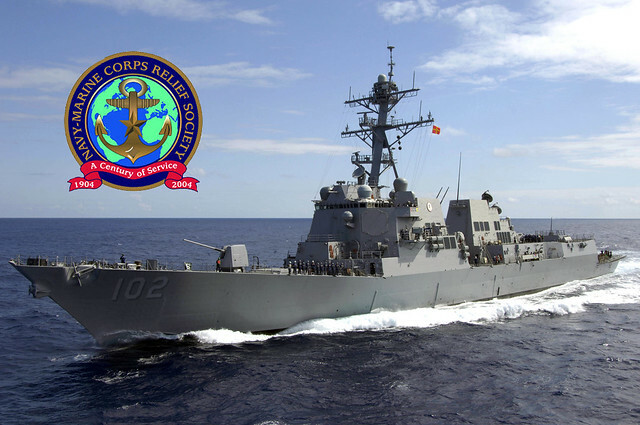 USS Sampson to Participate in Seattle Seafair. 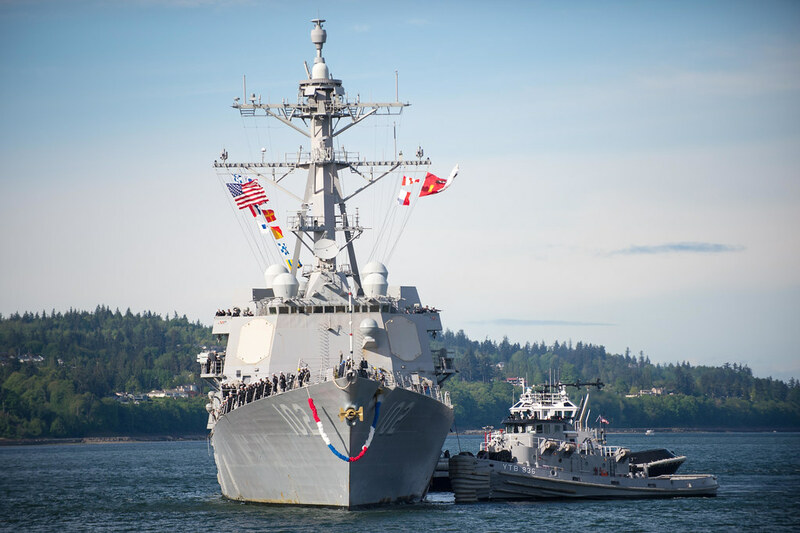 PORTLAND, Ore. (NNS) -- The 103rd annual Rose Festival's Fleet Week came to a close June 7, when the two U.S. Navy vessels who participated in this year's Rose Festival sailed out from the Tom McCall Waterfront Parks in downtown Portland. PORTLAND, Ore. (NNS) -- USS Sampson (DDG 102) namesake family members visited the ship in Portland, Ore., June 6. Rear Adm. William T. Sampson's great grandson Thomas Sampson and his wife Martha visited their family namesake ship during Navy Week and the Portland Rose Festival. 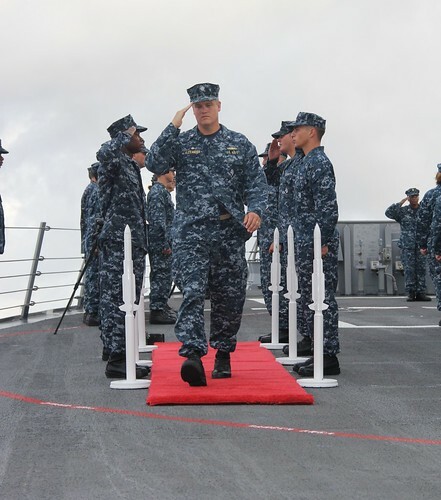 PORTLAND, Ore. (NNS) -- Thirty World War II era veterans were recognized during an award ceremony held aboard the guided-missile destroyer, USS Sampson (DDG 102) in Portland, Ore., June 5. United States Congressman David Wu individually thanked each veteran in attendance and presented awards for their service. WASHINGTON (NNS) -- Master Chief Petty Officer of the Navy (MCPON)(SS/SW) Rick D. West traveled to San Diego and Chattanooga, Tenn., to visit Sailors and celebrate Armed Forces Day May 3-8. 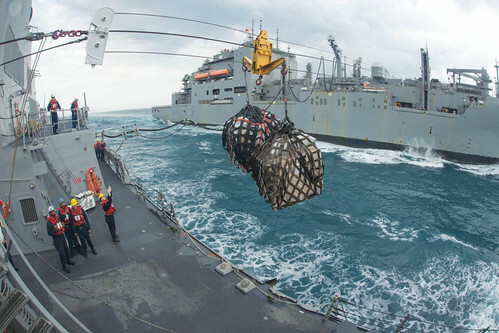 The guided-missile destroyer USS Sampson (DDG 102) and an MH-60S Sea Hawk helicopter assigned to the Wildcards of Helicopter Sea Combat Squadron (HSC) 23 embarked aboard the aircraft carrier USS Nimitz (CVN 68) operate during a replenishment at sea. Nimitz Carrier Strike Group arrived in Kuala Lumpur for a four-day port call.